Directoire Style armchair, circa 1795. Dimensions : 90 h x 56 w x 47 d cm. Original : Brussels antiquarian Belgium. 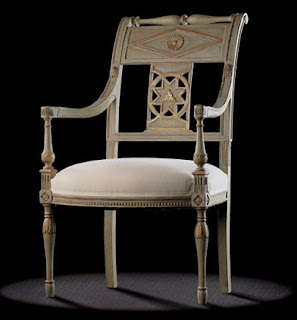 A magnificent Directoire Style armchair with splat with openwork star motif, whose highly varied carved decoration (palmettes, stars, lozenges, rosettes, fluting, water lilies, raies de cœur, etc.) allows for many colour combinations. The stiles are en crosse and the sabre legs, scrolled at the top, provide solidity in an otherwise airy construction. WHERE IS THE PRICE FOR THIS PIECE? Is this chair still available to puchase? Is there more than one?